Nestled at the foot of Little Mountain, Breckenridge South real estate will feel securely rooted in the valley not far from Illinois Creek, and a short hop along a paved sidewalk to downtown along the old railroad bed which is Boreas Pass Road. While Little Mountain is impressive from the perspective of homes in Breck South, the mountain ends quickly and open up views to Baldy Mountain and trailheads to national forest and public open space. The ridge of Ford Hill is not far to the north and further shelters this neighborhood. This hill is steep just above Breck South and is sparsely developed, but there is a trail across it that offers another, more rustic, route to Carter Park and the center of Breckenridge. 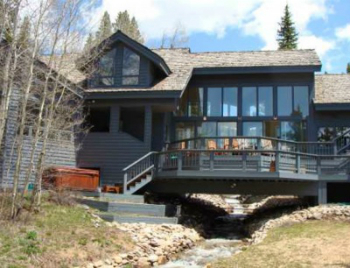 Breck South is a wooded neighborhood with several creeks and streams that lies within the town limits of Breckenridge. Check out the Breckenridge South homes for sale below, or read more about the desirable neighborhood. Most of the 15 lots in this subdivision were developed in the nineteen-nineties, and only two remain vacant. Breckenridge South homes are varied in size, but all have at least a half-acre lot. Home exteriors are generally more wood and less stone, a little less ostentatious than those in the Highlands, but were all custom-built and architecturally unique. The town plans to put the utility wires underground in 2014. From the Breckenridge South neighborhood, it’s a gentle roll into town by bike or skateboard, and an easy walk. Less than a minute by car to the ice rink and public transportation, anything in town is less than a 5-minute drive. Without getting into a car, hikers can find quick access to Illinois Gulch, the Blue River and the Moonstone trails, from these homes. The large generally flat lots and paved roads make a basketball hoop a usuable feature, which isn’t always the case in mountainous neighborhoods. 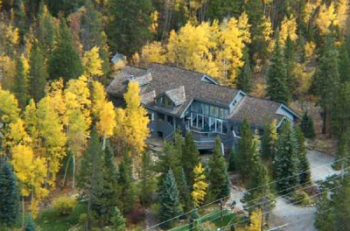 The school bus comes to Breckenridge South, and makes this a very family-friendly neighborhood. Size: 1897 to 5142 sq. ft. Amenities: walk to town, large lots, large homes, small neighborhood, close to hiking, biking trails. To find homes in Breckenridge South, turn left onto Boreas Pass at the southern most stoplight in Breckenridge about a half mile west is Brookside Drive, which contains several homes in Breckenridge South. Continue on Boreas Pass Road to Bright Hope, turn left onto Bright Hope and find the rest of the subdivision’s homes.